Yes, who was it last night? The two Matadors have been subject to frequent variation and I have never understood why they are listed when the Scallywags are not. Due to eternal train problems I only saw the first 2 acts last night, glad to hear that Act 3 was so good though, Yasmine Naghdi was so beautiful, a natural Kitri, as Marcelino Sambe was a natural Basilio. As Dave says, the first one hand lift was held for a very long time indeed, brilliant! Lots of cast changes, some I recognised, there was no pre-performance announcement last night. I noticed a charming young man both times I went, I'm sure someone will know his name, near the start of Act 1 he plays a guitar whilst Kitri is dancing? Thoroughly enjoyed the enchanting performances of all. Such a special occasion - from the top down. Many thanks, I have been reading good things about him! Last night was one of those nights I am truly happy to have been there and to have witnessed the new partnership between Yasmine Naghdi and Marcelino Sambe, and what a gorgeous partnership it was! Yasmine Naghdi has really matured into a graceful, very elegant ballerina, is in complete control of her superlative technique and in full possession of all the necessary skills to deliver a magnificent performance. Marcelino Sambe's impeccable partnering (very much improved since the Insight! ), combined with his great talent, makes me want to see more of these two dancing together. They were both absolutely wonderful, not only as individual dancers but also as a stage couple. The first one handed lift, well goodness me, I have never witnessed a longer one. And Naghdi's manege in Act 2 was at such a breakneck speed I wondered if the orchestra would be able to keep up with her. Naghdi/Sambe's Act III solos/pd2 were simply breathtaking. Anna Rose O'Sullivan, Fumi Kaneko, Matthew Ball, Lukas Bjorneboe Braendsrod/Romany Pajdak (Gypsy couple), Bennet Gartside (Gamache) and Gary Avis (DQ) all deserve my praise too. I thought the whole company was on great form (although I was less impressed by two female dancers). It was a very responsive audience, lots of cheers, and I could see several parts of the Orchestra Stalls giving Naghdi/Sambe a standing ovation. What a great show and what a superlative performance to end this run of Don Quixote (last one tonight). Can anybody hazard a guess as to why Two Matadors are no longer listed on the cast sheet? It's seems odd that this should change in the middle of a run. Perhaps someone realised it was odd to name the two matadors in Act 1 when it is a different two in Act 3? ... Bennet Gartside (Gamache) and Gary Avis (DQ) all deserve my praise too. 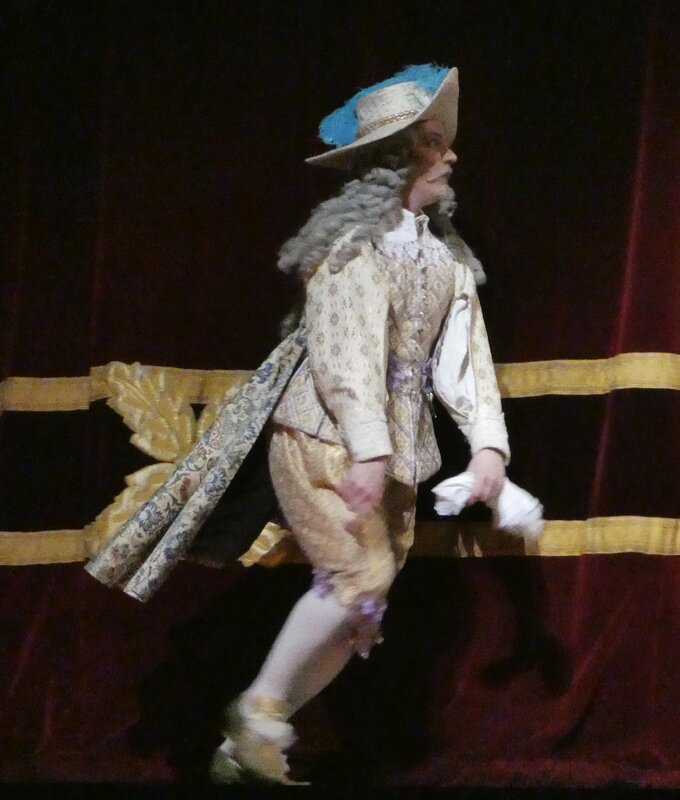 Last night, Gamache was Thomas Whitehead (Bennet Gartside was Lorenzo). The first one handed lift, well goodness me, I have never witnessed a longer one. I must admit, I've seen one which seemed almost as long, earlier in the run. I'm not sure that all the Basilios are comfortable musically (as opposed to technically) with extending it that long, but I could be mistaken. Those one-handed lifts...! About 12 years ago Ethan Stiefel guested with Australian Ballet as Basilio, partnering Rachel Rawlins (whom some may remember from her stint with the Royal Ballet). The first lift was long. The second was longer, and his free hand was flapping at the audience, encouraging them to clap more! At the dress rehearsal in 2013, Ivan Vasiliev not only held Natalia Osipova up for an eternity, he rose into arabesque on demi-pointe while doing so. She started laughing and the entire company on stage applauded him (as did we!). The conductor then plaintively asked if the orchestra could please continue from where they'd had to stop. We've got the cinemacast on Sunday to which I am looking forward, will be only my second view of this production (Acosta/Nuñez recording from the première season), and it's Alex Campbell (yay). I'm sat in the Floral Hall in the 1st interval and I'm thinking - how can anyone not love this ballet. It's pure joy from start to finish and so many marvellous performances to enjoy. Tonight it's Alex and Mayara and they are throwing themselves at it. I've never seen Mayara so expressive. We've got Gary Avis, Bennet Gartside and Tom Whitehead in the character roles and at times, I 'm struggling to know where to look, there's so much going on. I've got a great big grin on my face and there are 2 acts still to enjoy. Loving Meaghan Hinkins and Anna Rose O'Sullivan as Kitri's 2 friends plus Nicol Edmonds and the rest of the matadors AND Itziar Mendizabal as Mercedes. Joy. I’m really fed up that I had to miss the cinema screening. What a lovely performance from Mayara Magri. Glad I went a second time despite not being a fan of the ballet. Rob S you don't think it was last night pranks do you? I'm not sure about those extended lifts (especially when the Basilios wave encouragement to the audience). Call me an old Scrooge but it's not a circus. Quite. Nor is the Royal Ballet the Bolshoi. After attending the Linbury screening of "Yuli" last night (which incidentally featured various Don Q snippets) is there any chance Carlos Acosta will take applause on stage tonight at the end of this successful run? No appearance I am afraid, so his production and choreography has to be acknowledged "in absentia". The audience on this last night were particularly appreciative, with much enthusiasm and warmth, and indeed a partial standing ovation, for everyone on stage, after another brilliant performance at the end of a brilliant run. I was so impressed again by the commitment and skill of these dancers, many of whom had to perform multiple roles- Tomas Mock had three (a matador, the gypsy leader, and the lead fandango gentleman), and I noticed Dulcinea (Lara Turk) making an appearance again at the end as a fandango lady - something Don Q clearly missed ! And the wonderful Itziar Mendizabal was both Mercedes and the lead gypsy. Injury seems to be robbing us of male first soloists at the moment, but Nicol Edmonds, for Valentino Zucchetti, was a particularly striking Espada - I think he has a great future ahead. I loved Claire Calvert's sophisticated Queen of the Dryads....and as for lumps in the throat, I don't even need movement - just the gorgeous tableau of Dryads revealed by Amour at the start of Don Q's dream...virtually worthy of the ticket price in itself! And then they dance...The elegant classicism in Act 2 is superb. Mayara Magri put in a very assured and confident performance in what I believe was only her second time out in a full length "principal" role (what amazing fouettés !) , assisted by Alexander Campbell as her ever-attentive partner, and delighting us again in his own strong, character-full performance. My only criticism was with the casting of the "characters" this time out. I preferred the earlier castings for Sancho Panza to Jonathan Howells' rather timid version. And I love Gary Avis normally, but he over-played Don Q as a rather doddery old duffer, and I missed the dreamy poignancy of Christopher Saunders' romantic knight-errant. In fact after a while I tended not to notice Don Q at all last night. Gary Avis was much better as Lorenzo. In turn Bennet Gartside (Lorenzo last night) much better when he played Gamache - I suppose purse-gate (see Rob S above) didn't help although Campbell improvised very cleverly at that point. But Thomas Whitehead's Gamache was, again, a tour-de-force! We sat next to two ladies for whom this was their first ballet - what a good choice! As newbies they were understandably astonished that we had already seen this 5 times 🤭 (multiple viewings have failed to dim, for us, the pure joy of this ballet!) - perhaps they were less surprised by the end, as they were absolutely thrilled with it, and hopefully have caught the ballet bug....! Ginevra Zambron has been in the corps for acts 2 & 3 a number of times now. Magri's probably on her 4th? principal role now, after her Gamzattis last autumn. Sorry yes I had overlooked those. I didn't dare to say this earlier but I found the wonderful Gary Avis miscast as the Don. He seemed far too 'busy' all the time. Well, it was a Sydney Easter Saturday with an auditorium not quite three-quarters full, and I guess Mr Stiefel felt those who were there needed some encouragement...and Mr Vasiliev was playing up at a dress rehearsal, I did see the performance "proper" and he didn't do it. I saw a performance when Ivan Vasiliev's Basilio dropped out of character to 'gurn'/wave encouragement to the audience several times. It didn't work for me. Several RB Basilio performances (notably those from Marcelino Sambe and Vadim Muntagirov) have had the audience gasping and cheering at the sheer brilliance of their dancing without any need for prompting. It's funny- I wasn't much looking forward to it or very enthusiastic at all- as many others I believe- but now am hoping it comes back in a couple of years' time!